Spilt emulsion and Festool RO90 to the rescue. Sometimes in a Painter & Decorator’s busy life, they have to overfill the backs of theirs van in a fashion they are not likely to do on an everyday basis. Most of us are a tidy bunch, we keep the paints and tools etc in the rear of the van within easy reach and like to have tools and materials to hand. Anyway, cutting a long story short, the B&A van was slightly more piled up in the back than usual this particular day. On my way to work, 5 litres of brilliant white Johnstone’s Trade Covaplus Vinyl Matt Emulsion toppled over and popped its lid… Doh! This was the remnants of the emulsion. 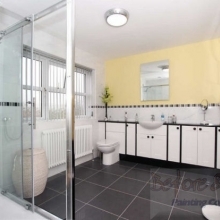 It may not spread that far on a wall area, but by crikey, if it is floating around the floor pan of your van or for you DIY’ers, your car boot, the paint goes a long way. Always secure your load! The Festool RO90 is a fantastic tool for removal of paint back to sound timber. It has been one of my best bought tools from 2013. 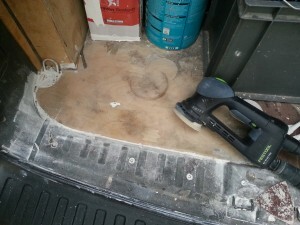 Apart from the Festool Midi Extractor that extracts 98% of the dust generated by sanding. 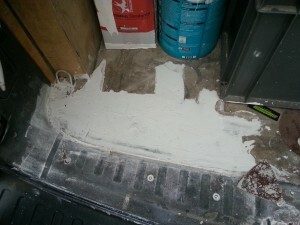 This makes sanding healthier for myself and the homeowner when using the system in your home.